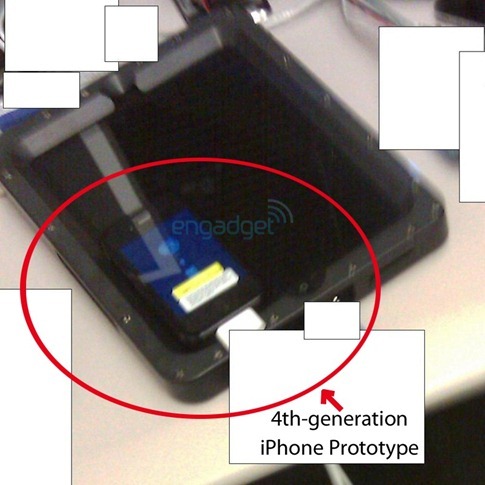 In the midst of all the iPad hype, what everyone seems to have missed was a leaked image of the next generation iPhone by Apple in one of the leaked images of iPad, which Engadget had posted just a few hours before the official announcement. As you can see from the image below, the form factor mostly remains the same as iPhone 3G/3GS except for the few finer improvements here and there. But what we can expect from Apple is some drastic changes underneath the shell with a faster processor, a 5 megapixel camera with LED flash, camera on the front for video conferencing, support for WiFi-N standard and so on. On the software side, iPhone OS 4.0 is expected to make an appearance with the next-gen iPhone with some sort of support for multitasking, video conferencing, a revamped customizable homescreen and so on. The new changes in iPhone OS 3.2 which runs on the newly announced iPad also confirms these features as a part of SDK. WWDC (World Wide Developers Conference) for the last two years has been home to new iPhone (hardware + software) announcements. Apple this year has booked a “Corporate Event” to be held at Mascone Center between Monday, June 28, 2010 to Friday July 2, 2010. This is the usual time slot when Apple holds its annual WWDC event. So chances of next-gen iPhone announcement is likely going to be made at this event. This is a very old image dude!